Stu Maschwitz over at ProLost just posted that his company, The Orphanage, has recently purchased a Nucoda Film Master and used it in the production pipeline for finishing Frank Miller’s new film The Spirit. Looks a bit different from Color’s interface, eh? I can see it has the ability to create user shapes, for starters. And it appears to have a left-to-right node tree under the timeline. [Colorists] want a high quality, random access source on an open architecture system in a standard format. We want fast, easy access and real time playback and we want the Holy Grail – one master that can produce multiple formats and versions. It’s interesting to consider the work flow Color presents and take note where it may fall short in the eyes of seasoned and talented colorists out there like Mr. Shaw. I feel lucky enough to have Final Touch / Color available to begin my path down the colorist road. By color correction I mean adjusting the color balance and contrast of an image to compensate for unwanted flaws or deficiencies in a capture or conversion process, so that the image more closely matches the original. Examples of flaws are overexposure, underexposure, or colorcasts, while deficiencies include limited dynamic range or change of color space. 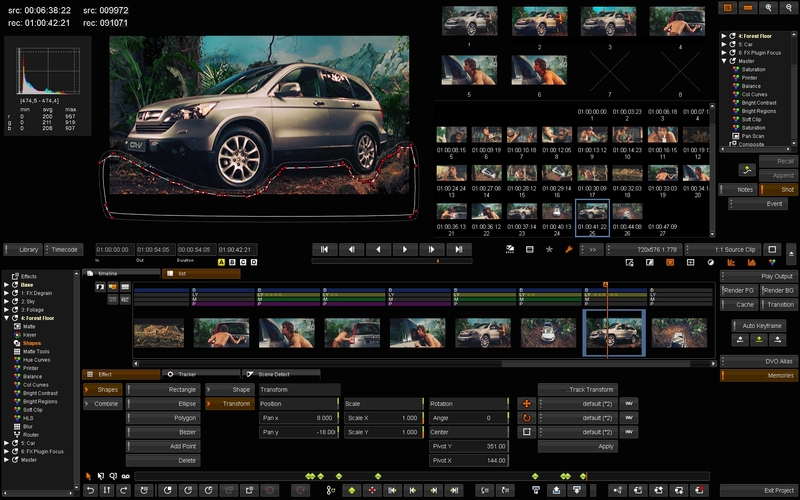 Both labs and telecine suites color correct images. Color enhancement is a change to the image that does not necessarily reflect reality, but which is intended to add emphasis or meaning to the image. Enhancements may or may not be planned at the shooting stage. Enhancements are usually applied to elements within an image and therefore the implication is that it involves a colorist with a more sophisticated post-production color system. Color creativity does not have an established industry definition, but I use it here to mean the use of color and contrast to define a look or style that is not necessarily related to the original image, but more to an abstract theme or message. The term therefore is wider in concept than color enhancement, and would include art direction and photography as well as direct color manipulation. In theory it should be a preconceived collaborative effort, but that is not always the case. It’s really cool to see the big boys showing off their toys and shedding light on what they can do. All I know as far as price point goes is that the Film Master requires Bluefish 444 hardware and Bluefish is notably the most expensive, and highest quality, third party hardware on the market (when compared to a Blackmagic Intensity Pro or the like). So it ain’t cheap. But then if you’re in the feature biz you aren’t thinking in terms of thousands of dollars, you’ve moved on to money aside, what tool will do the best job thought processes. One can only dream.